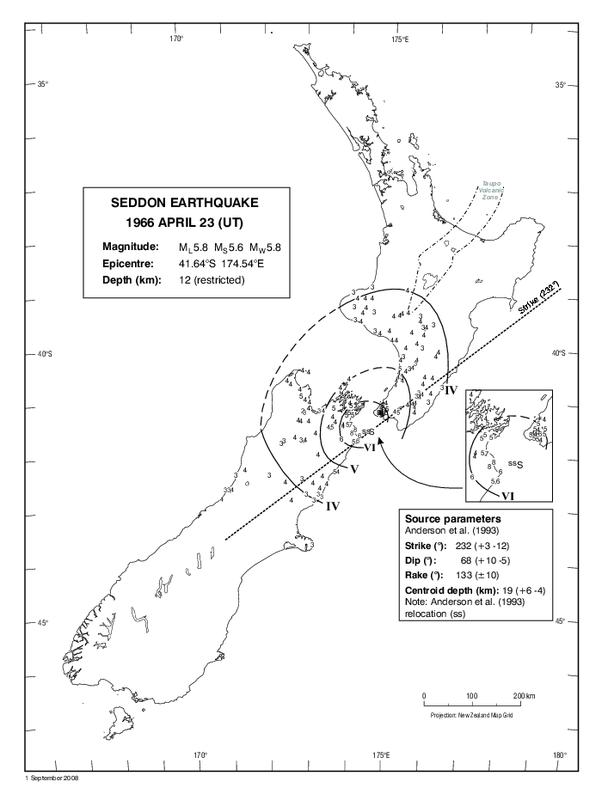 Isoseismal map of the Seddon earthquake. Courtesy Atlas of isoseismal maps of New Zealand earthquakes (2nd edition): Downes, G.L. ; Dowrick, D.J. The earthquake that struck Cook Strait in the early evening of 23 April 1966, was felt over much of New Zealand. Although its magnitude was not exceptionally large, this earthquake had a large impact because it was located close enough to centres of high population to cause significant damage. The highest reported intensities came from the small town of Seddon, about 35 km from the epicentre, where almost every house’s chimney cracked or broke and household goods were damaged. Railway lines were affected, water mains were broken, and electricity and telephone services failed. In Blenheim older chimneys cracked, as well as in Wellington, where some windows also broke.